Spellbinding feats, like the superb free kick by footballer Faiz Subri (right), is why sports fans pack stadiums or are hooked to their television sets to catch those magical moments. 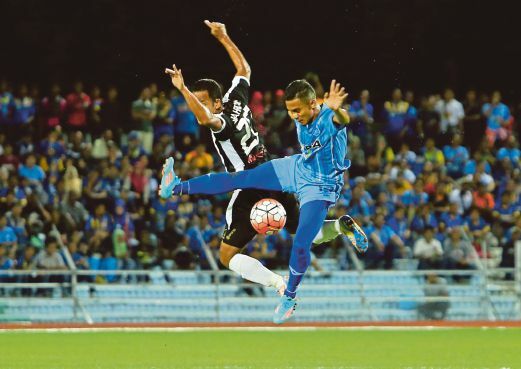 In a flash of brilliance, a journeyman footballer who now plays for Penang may have etched his name in the annals of world football and also answered the nagging question that generally comes from men’s other half, why their spouses are glued to the television every weekend night. Much of last week belonged to the outrageous free kick performed by Faiz Subri. The seemingly impossible but a gem of a goal is all over YouTube for all to see. Nothing more should be added here, nor is there any need to debate whether it was or wasn’t a fluke, or whether his feat does or doesn’t deserve the Puskas Award. It was nothing less than a beautifully taken free kick that produced an even more beautiful result. It sits right up there with, if not above, Brazilian player Roberto Carlos’ famous long-range swerving kick that reduced French goalkeeper, Fabian Barthez, to a bewildered spectator at the Tournoi De France in 1997. Magical moments, such as the feat accomplished by Faiz, happen at times in sport. No one, for instance, gave American golfer, Tiger Woods, any chance of sinking what seemed an impossible chip from outside the 16th green at the Augusta National golf course during the 2005 US Masters golf tournament. The crowd around the green froze as the ball landed some six metres above the hole before rolling down, stopping for a brief moment at the tip, just long enough to display the Nike logo on it, before disappearing into the cup to a roar that shook even the television cameras. Woods went on to win that year. Or the way that Woods’ compatriot, Bubba Watson, in a sudden-death playoff at the same tournament years later, bent flight of the golf ball from under the trees by Augusta’ s 10th fairway, landing it on the green, and thereafter, two-putted for a par and the Masters Green Jacket. There is now a marker placed on the spot where Watson took the impossible shot to immortalise the feat. The sports channel ESPN went as far as to conduct a scientific study on how the shot was made possible, in its Sports Science edition. These are but some of the reasons why we sit in front of the television every weekend, to be entertained by such magical moments. And who would not marvel at Formula One racing legend, Germany’s Michael Schumacher. After winning Best Driver titles with Benetton in 1994 and 1995, Schumacher moved to Italy’s racing powerhouse, Ferrari, where he drove for 11 years, winning five consecutive titles between 2000 and 2004. Schumacher holds many records, including most championships, individual race victories, fastest laps, number of pole positions and the most number of races won in a single season, 13 in 2004. Statistically, he ranks as the greatest driver in Formula One’s history. I have plenty of admiration for top class sportsmen and sportswomen. In a world where only champions are remembered, it takes special people to win in any world-class sporting event these days. Some years ago, Kuala Lumpur hosted an international golf convention where, among the prominent golfers that attended, was South African great and former US Masters champion Gary Player. As part of his otherwise packed programme conducting talks and golfing clinics for children, Player managed to squeeze a round of golf with a few individuals. I was one of them. However, a thunderstorm interrupted our game, and as we took shelter at the halfway hut, I struck up a conversation with the legend, asking him about the level of competition at the US Masters, a golf tournament every professional golfer wants to win at least once in their career. Player described the very high level of competition at the tournament, saying, “At the Masters, the player who gets second will only be remembered by his wife and probably his dog”. How true. And not only was what Player said applicable in the golfing world. I am sure most of us know that the fastest man in the 100-metre dash is Jamaican sprinter Usain Bolt. I am quite sure, too, that very few would know who the second fastest is. It takes a lot to become a champion in anything, sports included. Usain Bolt must have run in numerous other competitions and at various levels before qualifying for the Olympics finals. It must have taken him years to train. Eventually, when he won and wrote a new 100-metre Olympics sprint record at the 2008 Olympiad in Beijing, Bolt must have pipped the next runner after him by no more than just a fraction of a second. But, that fraction of a second on the track, or that one-stroke difference at the US Masters golf tournament, or a top podium finish at the Formula One, is the one that separates a champion from the rest of the pack. They are what all sportsmen and sportswomen live for. Indeed, mental toughness and having the winning attitude are as vital in sport as physical strength. Today’s sportsmen and sportswomen train all the time as competition in any sport is at levels never seen before. It is not inconceivable that in the near future, the insanely swerving ball flight unleashed by Faiz last week will not only be a common sight in football matches, but a skill required of every footballer. in Faiz’s free kick, or that luck played a role, too, it is without a doubt that a certain special skill was required to impart what experts call a “spin” to the ball when it was kicked. Footballers, such as Faiz, will continue to hone the skill, as will future golfers continue making even more incredible shots and runners strive to break Bolt’s record, which seems humanly impossible to surpass for now. For the rest of us, we will continue to diligently wait in front of the television every weekend, hoping to see such feats with our own eyes.